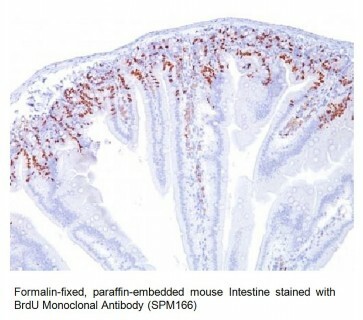 Anti-Bromodeoxyuridine (BrdU) Antibody (SPM166) | A1449 | BioVision, Inc. Monoclonal antibody to detect BrdU. It reacts with Bromodeoxyuridine (BrdU) in single stranded DNA (produced by partial denaturation of double stranded DNA), BrdU coupled to a protein carrier, as well as free BrdU. BrdU is a thymidine analog, incorporated into cell nuclei during DNA synthesis prior to mitosis. Antibody to BrdU is helpful in detecting S-phase cells, providing useful information on the aggressiveness of tumors.